Ernie and I have never collaborated on a review before. However, we both spent quite a bit of time with the T2000 and he asked me to add a few words to his recently posted review. The demo T2000 arrived at my home in November of 2011. Out of the box I set it up as an integrated amp, connecting two sources: my Tom Evans Groove phono amp and my Bryston BDP1/BDA1 combination. With just the Allnic powering my two ATC SCM40 loudspeakers, I was actually caught off guard by how good the system sounded. It wasn’t that I had any doubts about Allnic or the amp – I just didn’t expect a 70 watt tube amp to mate very well with my inefficient ATCs. I perceived the sound as intimate, with a very sweet sounding mid-range and detailed, smooth highs. However, as I had expected the low-end was a tad meek. I used the amp in this configuration for about a week and my appreciation for the amp grew the more I listened. Once I felt familiar with what I was hearing, I decided to up the ante a bit and connect the Allnic amplifier in a bi-amp configuration, adding a Bryston 4Bsst2 amp and a Modwright LS 36.5 pre-amp to the system. Because the ATC SCM40 is a 3-way speaker, I am able to separate the woofer, midrange driver and tweeter, and can experiment with how I strap the drivers together. I knew that the Bryston amp would be used for the woofer and that the Allnic would drive the tweeter, however I did experiment with which amplifier would handle the midrange. While testing each configuration, I also experimented with the Pentode and Triode mode settings for the T2000. After a few hours of listening I settled on using the Bryston 4Bsst2 to power the woofer, with the Allnic T2000 connected to both the midrange and the tweeter in Triode mode. After about an hour of listening on my own, with much of the time spent making minor adjustments to the level balance between the Bryston and the Allnic, I summoned my wife, Natalie, down to our listening room to play her some tracks. I consider Natalie my great equalizer – she loves listening to music as much as I do, however she has superior hearing, and is less invested in the process, and therefore is more objective in her analysis and reaction to the sound of the equipment than I am. She must have known that I was happy with the sound, but she sat quietly evaluating, listening with me as I switched between records and digital files . After about an hour she finally spoke and her first comment was, “this is lovely.” I concurred and we chatted some more about what we where hearing – it occurred to me that this was her first exposure to vacuum tube power amplification in our listening room, and so we spoke about the sound of tubes in general, and how that might be related to what we were hearing. After another thirty minutes or so, Natalie turned and asked another poignant question: “why aren’t we keeping this?” I was a bit stunned by her question. I explained the impracticality of the bi-amp configuration, the cost of the amp and my own basic resistance to using tube power for our main listening room. It’s a dual room that also runs my home theater and I don’t really want to turn on tubes to watch sports. Then a week passed and we were listening again – one of those late night listening sessions that involve a bit of wine and not so much critical introspection of the equipment. Deep into this session Natalie turned to me and playfully asked, “explain to me again why we aren’t looking to keep this amp?” I’m guessing you have an idea of where this is leading, so rather than try and explain why the T2000 sounds so good, I’m going to jump to my conclusion. 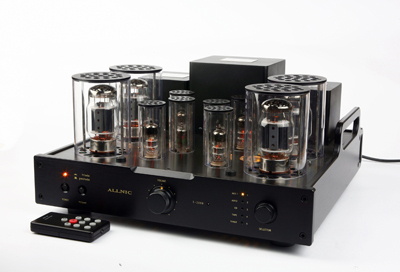 The Allnic T2000 is one of the finest tube power amplifiers that I’ve heard. Its overall combination of power, flexibility and sonic finesse are extremely rare at its price point. Although it is only driving my midrange and tweeter, it has taken my system to an entirely new level, with regard to all aspects of sonic performance: musical detail, nuance, energy, frequency extension – whatever flowery term one wants to dig up to describe sound, the Allnic T2000 produces it. However, during my time with the demo T2000, I was also able to hear the amp at Ernie’s with the various loudspeakers he used in his review, as well as at a friend’s house, connected to his Tannoy Churchill speakers. After a month of thorough listening it became obvious to me that Natalie was right and we simply could not let the T2000 go, so before the review sample left we ordered one of our own. I highly recommend this amplifier and would easily give it a full, 4 musical note rating. For me it represents the best of High-Fidelity and offers full value to the owner. A gem.